“Sorry, not a good idea,” we replied. “Why not! ?” Because on Saturdays, most pages in papers like, say, The Sunday Times and Sunday Telegraph are already full. Only big news stories get in. “Call them Sunday?” Answer: “No one in, it’s their day off.” “Aaagh! Monday then!” Sorry, also their day off. Client: “Oh, you guys are so clever. We really value your expertise!” . . . Expertise? Not really. It’s just we’ve ‘been there, done that’. Our team have a wealth of media experience. In our former jobs, in print, we’ve been editors, news editors, commissioning editors, reporters, production journalists, critics and foreign correspondents. Our previous broadcasting roles include TV researcher, scriptwriter, director and associate producer. 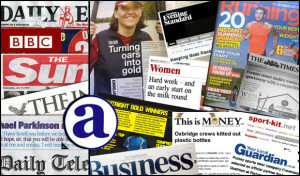 Between us, we’ve worked on TEN national newspapers, from the Sun and Mirror to the Times and Daily Telegraph. Our broadcasting experience includes years at BBC Television and a host of other ITV companies like London Weekend, Thames and Central, also independents like Planet 24. We’ve been reporters at the national news agency The Press Association, and worked on weekly and evening regional newspapers. Tabloids, broadsheets, freesheets, online, podcasts, vodcasts, picture galleries, you name it. So we know how to talk to the journalist, how to excite them with your story, when to call them, when not to. We know what they want, when they want it, how to get it to them. We have the experience to help you and you’ll be in safe hands. If you or your company are seeking to raise your media profile, talk to us. It will always be in strict confidence.